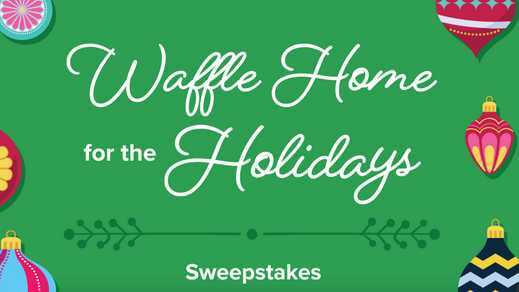 Enter into the Waffle House Home for the Holidays Sweepstakes right now for your chance to win 2 airline vouchers and 1 $500 Waffle House gift card and you could also win many exciting prizes. How To Enter: Go to this link:wafflehouse.com/holidays during the sweepstakes period and follow the online instructions to register by entering all information requested on the registration form and once you filled out the entry form now Click on the submit button to complete the registration form. Prizes: One lucky grand prize winner will win 2 airline vouchers and 1 $500 Waffle House gift card; FIRST PRIZES: William Michael Morgan Holiday Gift Package, consisting of 1 clothing item, 1 insulated beverage sleeve, 1 signed CD and 1 $50 Waffle House gift card. ARV: $200; SECOND PRIZES: 30” Plush Polar Bear with Knitted Scarf. ARV: $38.50. When To Enter: The Sweepstakes entry begins at 12:00 a.m. Eastern Time (“ET”), November 12, 2018 and ends at 11:59 p.m. ET, December 31, 2018. Who’s Sponsor: The Waffle House Home for the Holidays Sweepstakes is sponsored by Coca-Cola Company, One Coca-Cola Plaza, Atlanta, GA 30313.